Why Trade CAC 40 ‏(FRA40) with XM? At XM we offer CAC 40 ‏(FRA40) as cash and futures CFDs. Our cash index CFDs are undated transactions that aim to replicate the cash price of the underlying index, and so they are adjusted for interest and dividends. Index futures CFDs expire on specific future dates and are cash-settled on the expiry date. 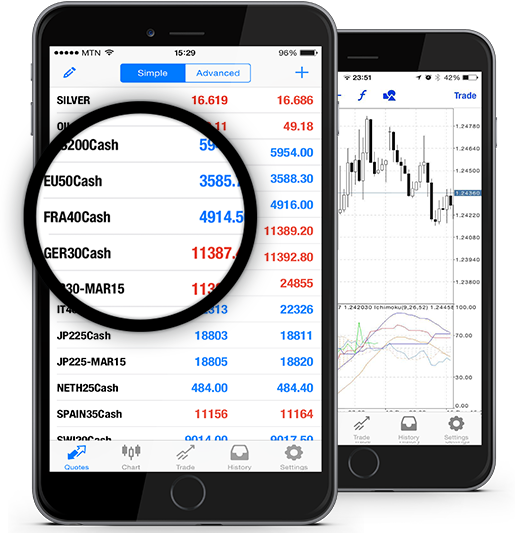 The French benchmark stock market index CAC 40 (FRA40) stands for Cotation Assistée en Continu, and it represents the top 40 values of the 100 highest market-capitalization company stocks traded on the French securities market Euronext Paris, the second largest exchange in Europe. The CAC 40 (FRA40) is one of the most frequently traded national indices of the Euronext pan-European stock exchange, with a market capitalization of over €1.031 trillion. Since 2003, the weighting system of the index has been changed to free-float market capitalization and its components have been reviewed by the Conseil Scientifique (Index Steering Committee) on a quarterly basis. About 45% of the CAC40 (FRA40) shares are owned by German, British, Japanese and American investors, which is due to the fact that the 40 constituent companies of this index are large international corporations. How to Start Trading CAC 40 ‏(FRA40)? Double-click on CAC 40 ‏(FRA40) from the “Market Watch” to open an order for this instrument.